*Note: estimating the impact on household goods and services has been undertaken across broad product categories and the estimates represent the average price impact across each category. Within each category there will be a range of goods with different levels of direct and indirect emission intensity, for instance due to the source of the electricity used in the production of a particular company or for a particular type of good. ** The ‘other’ category is comprised of a range of household expenditures expected to increase in price by around a quarter of a per cent, which represents an average increase in prices for services across the general economy. Analysis of these products is difficult due to data limitations — many of these products are not included in the CPI basket of goods and services, for example — such that specific price increases cannot be determined. Examples of these products include life insurance premiums, fees for some financial services, gambling and outright purchases of dwellings. 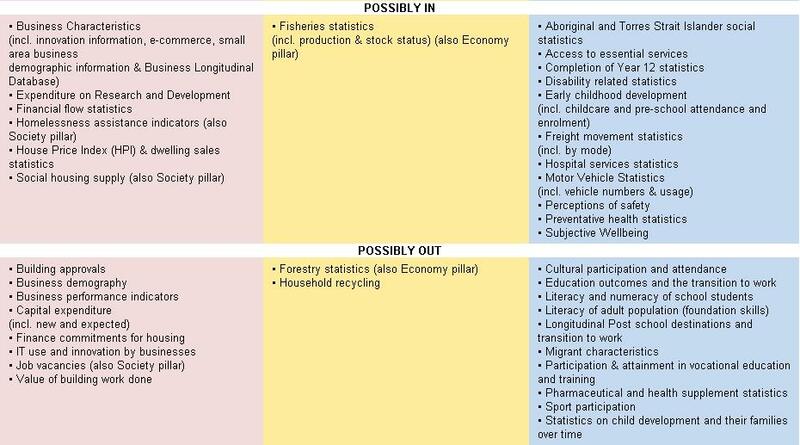 Job vacancy figures, capital expenditure figures and building approval counts are set for the chop in a major shakeup of what the Australian Bureau of Statistics does, one it says will concentrate its work on “essential” statistics at a time of “shrinking real resources”. Others with an uncertain future include disability services, house price indicies and motor vehicle sales. 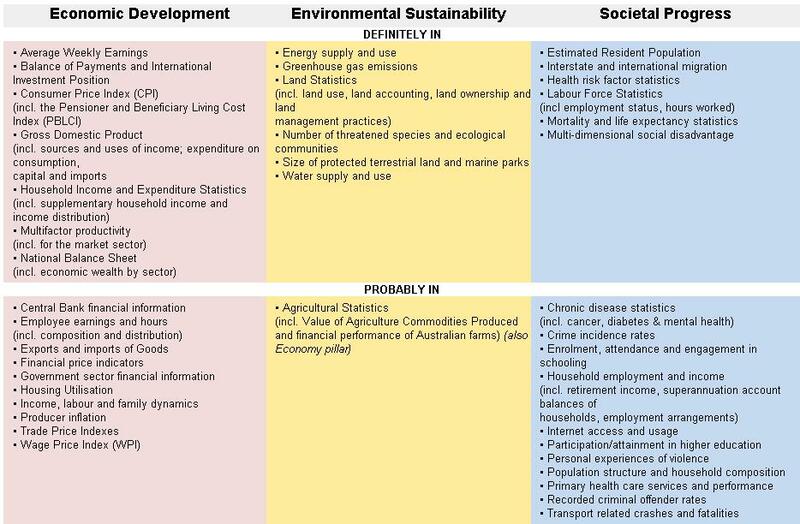 Details are at the National Statistical Service website: nss.gov.au Submissions are due by September 14. You may have noticed reports in some sections of the media today suggesting that a range of official statistics, including economic statistics, may be under threat as part of the Essential Statistical Assets for Australia initiative that was released yesterday by the ABS. The purpose of this note is to reassure that there are no plans to cut any ABS or other statistics as a result of this initiative. The aim of the initiative is to identify a small core set of statistics to target for potential future investment because of their broad application and critical use for decision-making. Clearly, the wider range of official statistics produced and used across Australia are still important. They will continue to be so, and will continue to be produced, managed and invested in.
. Australian statistics are top notch. Not. The Optus high speed cable internet network is a national asset. Comprising 25,000 kilometres of coaxial cable strung across 550,000 poles in Sydney, Melbourne and Brisbane supported by 7000 kilometres of fibre the provided Telstra with its first genuine competition, putting its own wires direct into half a million homes. Telstra fought back with FoxTel, Optus got burnt and has probably never recovered the cost of stringing the cables. But from an economic point of view what’s important is that the asset exists. Its costs have been sunk. What Optus has now is an asset that costs relatively little to operate and can deliver peak download speeds of 100 Mbps - far faster anything on Telstra’s copper wires. Right now it has 496,000 customers. It is within connecting distance of another one million meaning that for very little cost Optus or a buyer of the network could provide a very fast very cheap internet service to as many as 1.4 million households - a service far faster than ADSL. Only a vandal would destroy such an asset. Only a seriously confused regulator would allow it happen. NBN Co has asked the Australian Competition and Consumer Commission to let it pay Optus a reported $800 million to shut the network down. The only precedent for the destruction of infrastructure on such a massive scale is the $4 billion NBN Co is to pay Telstra to rip out its copper network, transfer its customers to the national broadband network and remove the internet from the cables it uses to deliver FoxTel. In no other industry would the ACCC approve such an agreement not to compete. In no other industry would it countenance a bribe to decommission working infrastructure. Mid last year it approved the Telstra deal. This week it published a draft decision approving the Optus deal. Telstra will decommission its copper phone lines street by street as the NBN cables are switched on. While there will be a loss of competition, copper probably isn’t able to compete with fibre over the long-term. By contrast the Telstra and Optus coaxial cables are as good as new. They were strung up in the last half of the 1990s. They are already fast and capable of being made faster. They cost almost nothing to maintain. They are something that should not be destroyed wantonly. The Telstra coaxial cables won’t be. It has only agreed to disconnect the internet from them. It could put it back as soon as changed legal or political circumstances allow. The Optus coaxial cables are scheduled for destruction. The ACCC’s decision will have physical consequences. It should not be taken lightly. And yet the ACCC gives every indication that its decision could have gone either way. It was “finely balanced”, according to chairman Rod Sims in Monday’s statement. Its decision to approve the agreement was based on weighing carefully “clear public benefits” against “a potentially large but less clear detriment”. The main “clear benefit” is odd. The Commission says the agreement will “avoid the cost of operating the Optus network to provide a service the NBN is also able to provide”. Would we apply it elsewhere? Should Virgin shut down its airline network to avoid the cost of operating a service Qantas is also able to provide? Should Woolworths shut down its network to avoid the cost of operating a service Woolworths is also able to provide? Of course they shouldn’t. We normally value competition. Some will argue that wiring up houses is different. Frontier Economics, the consultant used by Optus in its submission to the ACCC says fixed broadband services are a natural monopoly - they shouldn’t be provided twice. But Optus cable network is already in place. It costs next to nothing to keep it in place. It is NBN Co which is planning to duplicate it. Given its plans and the rate at which it is duplicating infrastructure right now, its complaint against “inefficient infrastructure duplication” is simply strange. In truth is competition that worries NBN Co, not inefficiency. It is paying $800 million to remove a competitor, not out of a public concern about inefficiency. With its last big fixed line competitor out of the way the only market restraint on its prices and quality of service will be wireless internet, and it’s on to that as well. 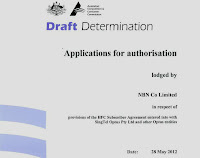 The Optus agreement given a preliminary tick by the ACCC prevents Optus from advertising wireless data services within the area served by its existing cables in a way which is “expressly critical of or makes any express adverse statement about the performance or functionality of the NBN where such a statement is misleading or deceptive or involves the making of a false or misleading representation in contravention of the Australian consumer law”. The ACCC waived it through because it essentially meaningless, requiring Optus to do no more than obey the law. But it indicates how deeply concerned NBN Co is at the prospect of competition, or as it puts it “cherry picking”. Competition would force it to provide value, and its national pricing structure would force it to provide it to all Australians. Its $36 billion cost base won’t allow it. That’s why it needs to destroy perfectly good working infrastructure. It’s why I think the ACCC needs to think again. "Optus is being paid $800m to shut down a tax-avoidance scheme"
The ACCC has authorised the NBN-Optus deal. So where do the public benefits come from? As background, remember that the ACCC can only authorise an otherwise anticompetitive agreement if the public benefits outweigh the public detriments. I have previously expressed my skepticism about this. So where are the benefits? The Box 1 on page 27 of the decision has the answer. And it illustrates the problem of the hidden cross subsidies built into the NBN. Suppose that the cost of providing broadband services to Optus’ broadband customers is lower on the NBN (formally, incremental costs are lower) but for some reason the NBN charges Optus (and other broadband retailers) a wholesale price that exceeds Optus’ own incremental cost. Then, in the retail marketplace, Optus will undercut the NBN and keep its customers despite it being cheaper to service them on the NBN. Hence, the customers must be forced to the NBN to achieve the incremental cost savings (albeit at the cost of creating an allocative loss as the end users face higher prices). The second argument is more convincing. Excessive pricing by the NBN. It is cheaper to provide services to the Optus customers using the NBN but the wholesale prices that the NBN will charge are so over inflated that this cost gain will be more than eaten up by the NBN monopoly pricing in the Optus service regions. In this case, the Optus customers must be forced onto the NBN to save the relevant costs, albeit to then be exploited by the NBN monopoly pricing. Now normally the ACCC would roll around the floor laughing if someone put this sort of argument to them. However, in the case of the NBN, monopoly pricing in city areas is necessary to create a uniform national price. The city will subsidise the bush. So the monopoly pricing is really just a hidden tax and, of course, the customers must be forced to pay this tax. So in brief the ACCC has authorised the NBN-Optus deal because (a) it believes that the cost of servicing the Optus customers is cheaper on the NBN and (b) it can’t be left to the market to sort this out because the NBN prices are so inflated by a hidden tax that the Optus customers would probably stay with Optus. Hmmm. So Optus is being paid $800m to shut down a tax-avoidance scheme? Well, that is what happens when you get bad policy. I have no trouble with a uniform national broadband price. But have the NBN set prices to reflect cost. And then provide a transparent subsidy to those consumers who the government believes should receive a lower price. Don’t hide the tax – it just leads to problems like that faced by the ACCC. Labor will get slaughtered whatever happens. The Coalition is likely to win control of the Senate as well. The best way to stop this is to call a House of Representatives election as soon as possible this year (after changing labor leaders) so the Reps election is not held with the Senate election. The Coalition will win in the Reps, begin implementing its program, become unpopular, and then probably not win control of the Senate when the half Senate election is held as scheduled next year. Labor will be better off than if it had waited. For this to work Labor would need to deny Tony Abbott the opportunity to call a double dissolution by ensuring none of his bills were blocked, which would mean voting in favour of bills to repeal the carbon tax and the mining tax (because “the people had spoken”). 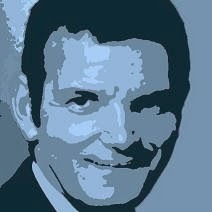 Applying Strategy 1 will mean the carbon tax will scarcely operate. It’ll be abolished just after it begins and the public discover that it is not so bad after all. It will forever go down in history as a bad idea. If instead Labor waits out its full term until late next year the public will have had a year to evaluate the carbon tax and might just find Tony Abbott was scaremongering when he said it would destroy Whyalla, kill the mining “stone dead” and so on. Few people would want to bother removing it (just as one year on few people wanted to bother removing the GST). Furthermore, although half the Senate would be elected with the Reps in late 2013, the new Senators would not take office until July 2014 -- two years into the carbon tax, and more importantly only one year away from 2015 when it is legislated to be replaced with an emissions trading system (which will probably have a lower carbon price). Relief will be at hand. Anger over the carbon tax will be old hat. Abbott might even have second thoughts about resubmitting to the Senate bills to abolish it. In any event the history books will record that it was a good reform, killed by a zealot, rather than a bad one killed by the people.